PHN (2.2) 2 or 3 divided doses per day 300 mg/day within 1 week. Maximum dose of 600 mg/day. Adjunctive Therapy for Adult Patients with Partial Onset Seizures (2.3) 2 or 3 divided doses per day Maximum dose of 600 mg/day. Fibromyalgia (2.4) 2 divided doses per day 300 mg/day within 1 week. Neuropathic Pain Associated with Spinal Cord Injury (2.5) 2 divided doses per day 300 mg/day within 1 week. Maximum dose of 600 mg/day. The maximum recommended dose of LYRICA is 100 mg three times a day (300 mg/day) in patients with creatinine clearance of at least 60 mL/min. Begin dosing at 50 mg three times a day (150 mg/day). The dose may be increased to 300 mg/day within 1 week based on efficacy and tolerability. Because LYRICA is eliminated primarily by renal excretion, adjust the dose in patients with reduced renal function [see Dosage and Administration (2.6)]. The recommended dose of LYRICA is 75 to 150 mg two times a day, or 50 to 100 mg three times a day (150 to 300 mg/day) in patients with creatinine clearance of at least 60 mL/min. Begin dosing at 75 mg two times a day, or 50 mg three times a day (150 mg/day). The dose may be increased to 300 mg/day within 1 week based on efficacy and tolerability. Because LYRICA is eliminated primarily by renal excretion, adjust the dose in patients with reduced renal function [see Dosage and Administration (2.6)]. Because LYRICA is eliminated primarily by renal excretion, adjust the dose in patients with reduced renal function [see Dosage and Administration (2.6)]. The recommended dose of LYRICA for fibromyalgia is 300 to 450 mg/day. Begin dosing at 75 mg two times a day (150 mg/day). The dose may be increased to 150 mg two times a day (300 mg/day) within 1 week based on efficacy and tolerability. Patients who do not experience sufficient benefit with 300 mg/day may be further increased to 225 mg two times a day (450 mg/day). Although LYRICA was also studied at 600 mg/day, there is no evidence that this dose confers additional benefit and this dose was less well tolerated. In view of the dose-dependent adverse reactions, treatment with doses above 450 mg/day is not recommended [see Adverse Reactions (6.1)]. Because LYRICA is eliminated primarily by renal excretion, adjust the dose in patients with reduced renal function [see Dosage and Administration (2.6)]. The recommended dose range of LYRICA for the treatment of neuropathic pain associated with spinal cord injury is 150 to 600 mg/day. The recommended starting dose is 75 mg two times a day (150 mg/day). The dose may be increased to 150 mg two times a day (300 mg/day) within 1 week based on efficacy and tolerability. Patients who do not experience sufficient pain relief after 2 to 3 weeks of treatment with 150 mg two times a day and who tolerate LYRICA may be treated with up to 300 mg two times a day [see Clinical Studies (14.5)]. Because LYRICA is eliminated primarily by renal excretion, adjust the dose in patients with reduced renal function [see Dosage and Administration (2.6)]. The risk of suicidal thoughts or behavior was generally consistent among drugs in the data analyzed. The finding of increased risk with AEDs of varying mechanisms of action and across a range of indications suggests that the risk applies to all AEDs used for any indication. The risk did not vary substantially by age (5–100 years) in the clinical trials analyzed. In the LYRICA controlled trials, dizziness was experienced by 30% of LYRICA-treated patients compared to 8% of placebo-treated patients; somnolence was experienced by 23% of LYRICA-treated patients compared to 8% of placebo-treated patients. Dizziness and somnolence generally began shortly after the initiation of LYRICA therapy and occurred more frequently at higher doses. Dizziness and somnolence were the adverse reactions most frequently leading to withdrawal (4% each) from controlled studies. In LYRICA-treated patients reporting these adverse reactions in short-term, controlled studies, dizziness persisted until the last dose in 30% and somnolence persisted until the last dose in 42% of patients [see Drug Interactions (7)]. Following abrupt or rapid discontinuation of LYRICA, some patients reported symptoms including insomnia, nausea, headache, anxiety, hyperhidrosis, and diarrhea. Taper LYRICA gradually over a minimum of 1 week rather than discontinuing the drug abruptly. In premarketing controlled trials of all populations combined, 14% of patients treated with LYRICA and 7% of patients treated with placebo discontinued prematurely due to adverse reactions. In the LYRICA treatment group, the adverse reactions most frequently leading to discontinuation were dizziness (4%) and somnolence (4%). In the placebo group, 1% of patients withdrew due to dizziness and <1% withdrew due to somnolence. Other adverse reactions that led to discontinuation from controlled trials more frequently in the LYRICA group compared to the placebo group were ataxia, confusion, asthenia, thinking abnormal, blurred vision, incoordination, and peripheral edema (1% each). In clinical trials of patients with neuropathic pain associated with spinal cord injury, 13% of patients treated with pregabalin and 10% of patients treated with placebo discontinued prematurely due to adverse reactions. In the pregabalin treatment group, the most common reasons for discontinuation due to adverse reactions were somnolence (3%) and edema (2%). In comparison, none of the placebo-treated patients withdrew due to somnolence and edema. 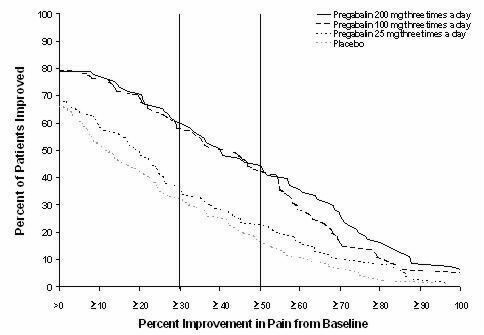 Other reasons for discontinuation from the trials, occurring with greater frequency in the pregabalin treatment group than in the placebo treatment group, were fatigue and balance disorder. Each of these adverse reactions led to withdrawal in less than 2% of patients. Table 7 lists all adverse reactions, regardless of causality, occurring in ≥2% of patients with neuropathic pain associated with spinal cord injury in the controlled trials. 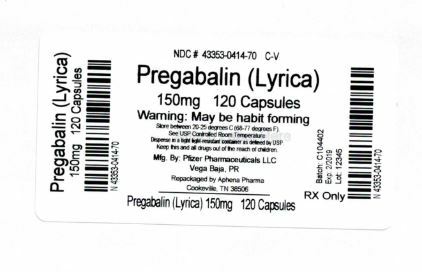 A majority of pregabalin-treated patients in clinical studies experienced adverse reactions with a maximum intensity of "mild" or "moderate". In addition, there are post-marketing reports of events related to reduced lower gastrointestinal tract function (e.g., intestinal obstruction, paralytic ileus, constipation) when LYRICA was co-administered with medications that have the potential to produce constipation, such as opioid analgesics. 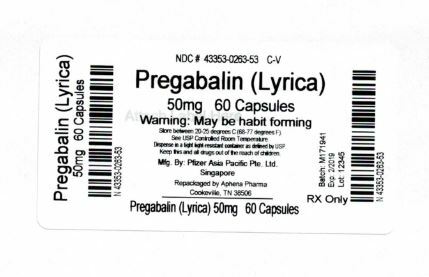 There are also post-marketing reports of respiratory failure and coma in patients taking pregabalin and other CNS depressant medications. LYRICA is known to be substantially excreted by the kidney, and the risk of toxic reactions to LYRICA may be greater in patients with impaired renal function. Because LYRICA is eliminated primarily by renal excretion, adjust the dose for elderly patients with renal impairment [see Dosage and Administration (2.6)]. In a study of recreational users (N=15) of sedative/hypnotic drugs, including alcohol, LYRICA (450 mg, single dose) received subjective ratings of "good drug effect," "high" and "liking" to a degree that was similar to diazepam (30 mg, single dose). In controlled clinical studies in over 5500 patients, 4 % of LYRICA-treated patients and 1 % of placebo-treated patients overall reported euphoria as an adverse reaction, though in some patient populations studied, this reporting rate was higher and ranged from 1 to 12%. 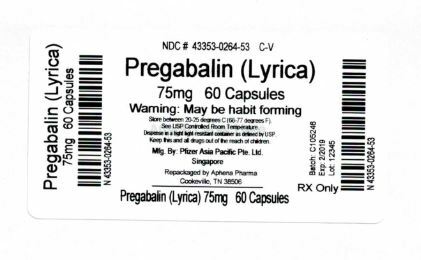 In clinical studies, following abrupt or rapid discontinuation of LYRICA, some patients reported symptoms including insomnia, nausea, headache or diarrhea [see Warnings and Precautions (5.8)], consistent with physical dependence. In the postmarketing experience, in addition to these reported symptoms there have also been reported cases of anxiety and hyperhidrosis. 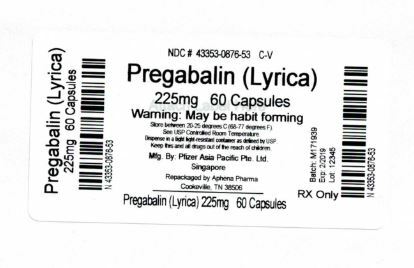 LYRICA (pregabalin) binds with high affinity to the alpha2-delta site (an auxiliary subunit of voltage-gated calcium channels) in central nervous system tissues. Although the mechanism of action of pregabalin has not been fully elucidated, results with genetically modified mice and with compounds structurally related to pregabalin (such as gabapentin) suggest that binding to the alpha2-delta subunit may be involved in pregabalin's anti-nociceptive and antiseizure effects in animals. In animal models of nerve damage, pregabalin has been shown to reduce calcium-dependent release of pro-nociceptive neurotransmitters in the spinal cord, possibly by disrupting alpha2-delta containing-calcium channel trafficking and/or reducing calcium currents. Evidence from other animal models of nerve damage and persistent pain suggest the anti-nociceptive activities of pregabalin may also be mediated through interactions with descending noradrenergic and serotonergic pathways originating from the brainstem that modulate pain transmission in the spinal cord. 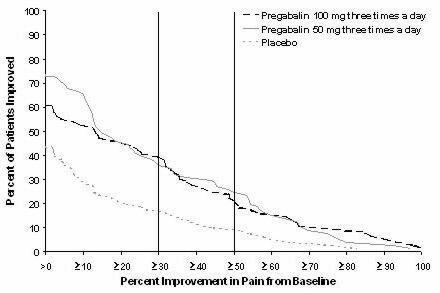 Pregabalin is eliminated from the systemic circulation primarily by renal excretion as unchanged drug with a mean elimination half-life of 6.3 hours in subjects with normal renal function. Mean renal clearance was estimated to be 67.0 to 80.9 mL/min in young healthy subjects. Because pregabalin is not bound to plasma proteins this clearance rate indicates that renal tubular reabsorption is involved. 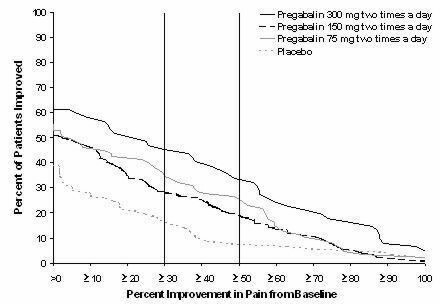 Pregabalin elimination is nearly proportional to creatinine clearance (CLcr) [see Dosage and Administration, (2.6)]. 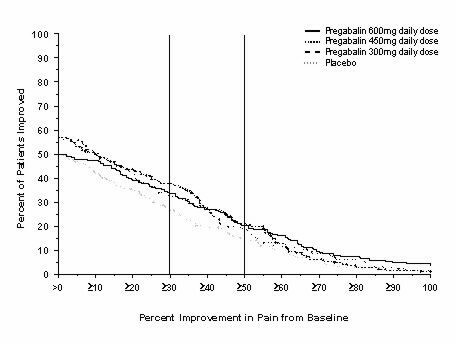 Pregabalin clearance is nearly proportional to creatinine clearance (CLcr). Dosage reduction in patients with renal dysfunction is necessary. 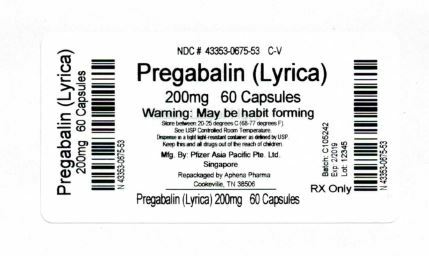 Pregabalin is effectively removed from plasma by hemodialysis. 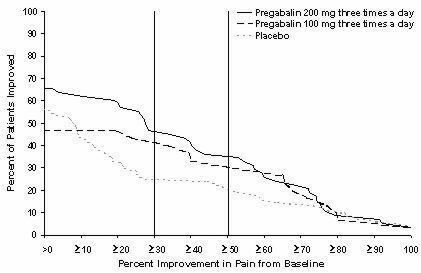 Following a 4-hour hemodialysis treatment, plasma pregabalin concentrations are reduced by approximately 50%. For patients on hemodialysis, dosing must be modified [see Dosage and Administration (2.6)]. Pregabalin oral clearance tended to decrease with increasing age. This decrease in pregabalin oral clearance is consistent with age-related decreases in CLcr. Reduction of pregabalin dose may be required in patients who have age-related compromised renal function [see Dosage and Administration, (2.6)]. 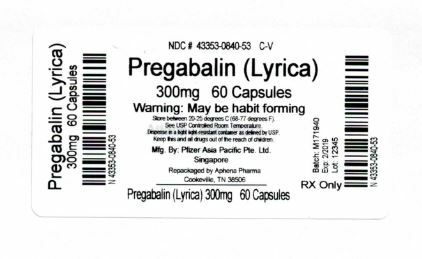 Pregabalin, at concentrations that were, in general, 10-times those attained in clinical trials, does not inhibit human CYP1A2, CYP2A6, CYP2C9, CYP2C19, CYP2D6, CYP2E1, and CYP3A4 enzyme systems. 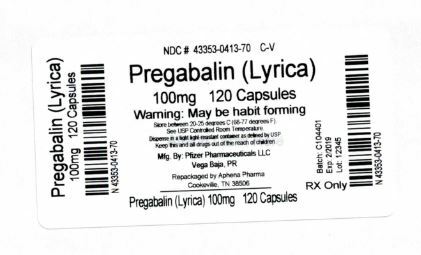 In vitro drug interaction studies demonstrate that pregabalin does not induce CYP1A2 or CYP3A4 activity. Therefore, an increase in the metabolism of coadministered CYP1A2 substrates (e.g. theophylline, caffeine) or CYP 3A4 substrates (e.g., midazolam, testosterone) is not anticipated. Study DPN 1: This 5-week study compared LYRICA 25, 100, or 200 mg three times a day with placebo. Treatment with LYRICA 100 and 200 mg three times a day statistically significantly improved the endpoint mean pain score and increased the proportion of patients with at least a 50% reduction in pain score from baseline. There was no evidence of a greater effect on pain scores of the 200 mg three times a day dose than the 100 mg three times a day dose, but there was evidence of dose dependent adverse reactions [see Adverse Reactions (6.1)]. For a range of levels of improvement in pain intensity from baseline to study endpoint, Figure 1 shows the fraction of patients achieving that level of improvement. The figure is cumulative, so that patients whose change from baseline is, for example, 50%, are also included at every level of improvement below 50%. Patients who did not complete the study were assigned 0% improvement. Some patients experienced a decrease in pain as early as Week 1, which persisted throughout the study. Study DPN 2: This 8-week study compared LYRICA 100 mg three times a day with placebo. Treatment with LYRICA 100 mg three times a day statistically significantly improved the endpoint mean pain score and increased the proportion of patients with at least a 50% reduction in pain score from baseline. For various levels of improvement in pain intensity from baseline to study endpoint, Figure 2 shows the fraction of patients achieving that level of improvement. The figure is cumulative, so that patients whose change from baseline is, for example, 50%, are also included at every level of improvement below 50%. Patients who did not complete the study were assigned 0% improvement. Some patients experienced a decrease in pain as early as Week 1, which persisted throughout the study. 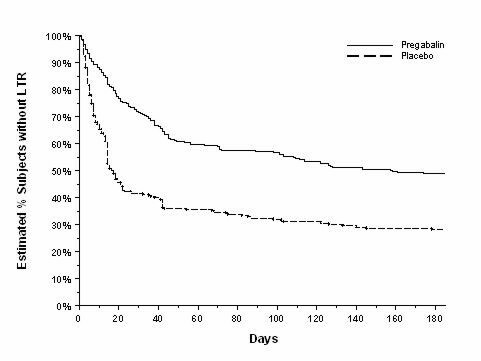 Study PHN 1: This 13-week study compared LYRICA 75, 150, and 300 mg twice daily with placebo. Patients with creatinine clearance (CLcr) between 30 to 60 mL/min were randomized to 75 mg, 150 mg, or placebo twice daily. Patients with creatinine clearance greater than 60 mL/min were randomized to 75 mg, 150 mg, 300 mg or placebo twice daily. In patients with creatinine clearance greater than 60 mL/min treatment with all doses of LYRICA statistically significantly improved the endpoint mean pain score and increased the proportion of patients with at least a 50% reduction in pain score from baseline. Despite differences in dosing based on renal function, patients with creatinine clearance between 30 to 60 mL/min tolerated LYRICA less well than patients with creatinine clearance greater than 60 mL/min as evidenced by higher rates of discontinuation due to adverse reactions. For various levels of improvement in pain intensity from baseline to study endpoint, Figure 3 shows the fraction of patients achieving that level of improvement. The figure is cumulative, so that patients whose change from baseline is, for example, 50%, are also included at every level of improvement below 50%. Patients who did not complete the study were assigned 0% improvement. Some patients experienced a decrease in pain as early as Week 1, which persisted throughout the study. Study PHN 2: This 8-week study compared LYRICA 100 or 200 mg three times a day with placebo, with doses assigned based on creatinine clearance. Patients with creatinine clearance between 30 to 60 mL/min were treated with 100 mg three times a day, and patients with creatinine clearance greater than 60 mL/min were treated with 200 mg three times daily. Treatment with LYRICA statistically significantly improved the endpoint mean pain score and increased the proportion of patients with at least a 50% reduction in pain score from baseline. For various levels of improvement in pain intensity from baseline to study endpoint, Figure 4 shows the fraction of patients achieving those levels of improvement. The figure is cumulative, so that patients whose change from baseline is, for example, 50%, are also included at every level of improvement below 50%. Patients who did not complete the study were assigned 0% improvement. Some patients experienced a decrease in pain as early as Week 1, which persisted throughout the study. 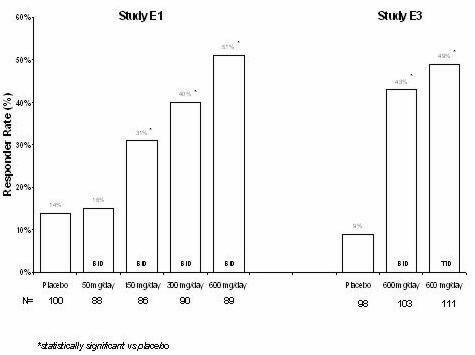 Study PHN 3: This 8-week study compared LYRICA 50 or 100 mg three times a day with placebo with doses assigned regardless of creatinine clearance. Treatment with LYRICA 50 and 100 mg three times a day statistically significantly improved the endpoint mean pain score and increased the proportion of patients with at least a 50% reduction in pain score from baseline. Patients with creatinine clearance between 30 to 60 mL/min tolerated LYRICA less well than patients with creatinine clearance greater than 60 mL/min as evidenced by markedly higher rates of discontinuation due to adverse reactions. For various levels of improvement in pain intensity from baseline to study endpoint, Figure 5 shows the fraction of patients achieving that level of improvement. The figure is cumulative, so that patients whose change from baseline is, for example, 50%, are also included at every level of improvement below 50%. Patients who did not complete the study were assigned 0% improvement. Some patients experienced a decrease in pain as early as Week 1, which persisted throughout the study. Table 8 shows median baseline seizure rates and median percent reduction in seizure frequency by dose. 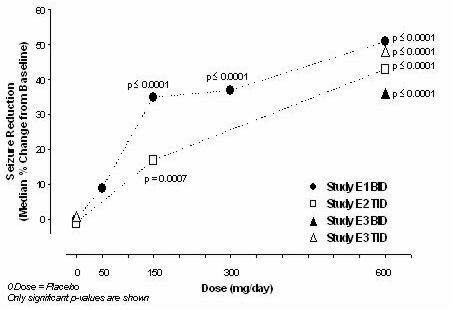 Study F1: This 14-week study compared LYRICA total daily doses of 300 mg, 450 mg and 600 mg with placebo. Patients were enrolled with a minimum mean baseline pain score of greater than or equal to 4 on an 11-point numeric pain rating scale and a score of greater than or equal to 40 mm on the 100 mm pain visual analog scale (VAS). The baseline mean pain score in this trial was 6.7. Responders to placebo in an initial one-week run-in phase were not randomized into subsequent phases of the study. A total of 64% of patients randomized to LYRICA completed the study. There was no evidence of a greater effect on pain scores of the 600 mg daily dose than the 450 mg daily dose, but there was evidence of dose-dependent adverse reactions [see Adverse Reactions (6.1)]. Some patients experienced a decrease in pain as early as Week 1, which persisted throughout the study. The results are summarized in Figure 8 and Table 9. For various levels of improvement in pain intensity from baseline to study endpoint, Figure 8 shows the fraction of patients achieving that level of improvement. The figure is cumulative. Patients who did not complete the study were assigned 0% improvement. Some patients experienced a decrease in pain as early as Week 1, which persisted throughout the study. The efficacy of LYRICA for the management of neuropathic pain associated with spinal cord injury was established in two double-blind, placebo-controlled, multicenter studies. Patients were enrolled with neuropathic pain associated with spinal cord injury that persisted continuously for at least three months or with relapses and remissions for at least six months. A total of 63% of patients completed study 1 and 84% completed study 2. The patients had a minimum mean baseline pain score of ≥4 on an 11-point numerical pain rating scale ranging from 0 (no pain) to 10 (worst possible pain). The baseline mean pain scores across the two studies ranged from 6.5 to 6.7. Patients were allowed to take opioids, non-opioid analgesics, antiepileptic drugs, muscle relaxants, and antidepressant drugs if the dose was stable for 30 days prior to screening. Patients were allowed to take acetaminophen and nonsteroidal anti-inflammatory drugs during the studies. 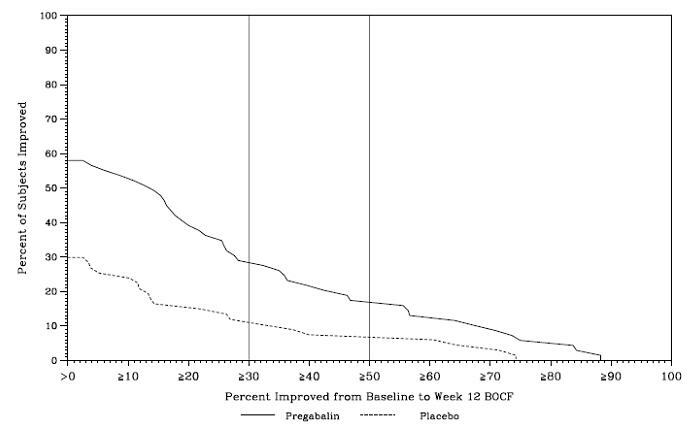 Study SCI 1: This 12-week, randomized, double-blind, parallel-group, multicenter, flexible dose (150–600 mg/day) study compared pregabalin with placebo. The 12-week study consisted of a 3-week dose adjustment phase and a 9-week dose maintenance phase. Treatment with LYRICA 150–600 mg/day statistically significantly improved the endpoint weekly mean pain score, and increased the proportion of patients with at least a 30% and 50% reduction in pain score from baseline. 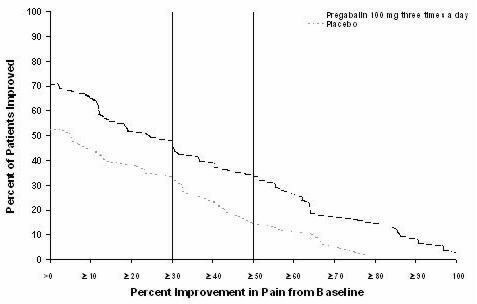 The fraction of patients achieving various levels of improvement in pain intensity from baseline to Week 12 is presented in Figure 10. Some patients experienced a decrease in pain as early as week 1, which persisted throughout the study. 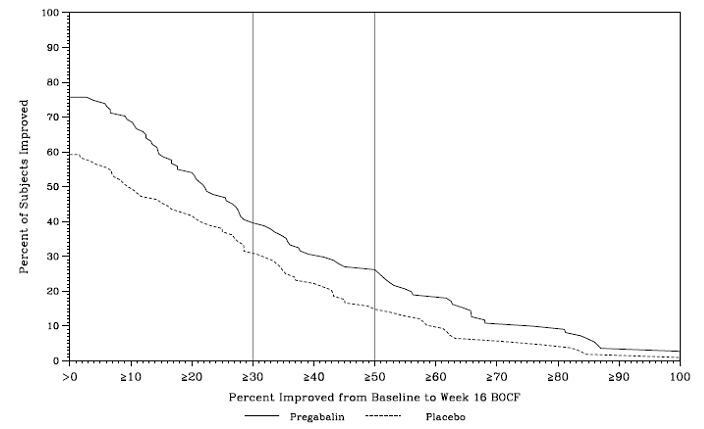 Study SCI 2: This 16-week, randomized, double-blind, placebo-controlled, parallel-group, multicenter, flexible dose (150–600 mg/day, in increments of 150 mg) study compared the efficacy, safety and tolerability of pregabalin with placebo. The 16-week study consisted of a 4-week dose adjustment phase and a 12-week dose maintenance phase. Treatment with LYRICA statistically significantly improved the endpoint weekly mean pain score, and increased the proportion of patients with at least a 30% and 50% reduction in pain score from baseline. The fraction of patients achieving various levels of improvement in pain intensity from baseline to Week 16 is presented in Figure 11. Some patients experienced a decrease in pain as early as week 1, which persisted throughout the study. Store at 25°C (77°F); excursions permitted to 15°C to 30°C (59°F to 86°F) (see USP Controlled Room Temperature). Advise patients to take LYRICA as prescribed. Abrupt or rapid discontinuation may result in insomnia, nausea, headache, anxiety, hyperhidrosis, or diarrhea. [see Warnings and Precautions (5.8)]. Inform patients who require concomitant treatment with central nervous system depressants such as opiates or benzodiazepines that they may experience additive CNS side effects, such as somnolence [see Warnings and Precautions (5.6) and Drug Interactions (7)].